There is a saying “What does not kill you only makes you stronger,” and I am living proof. I came to work for the Space Shuttle Program in 1995 as a summer college student, participating in NASA’s program for the physically disabled. I qualified because I am a paraplegic. When I was 9 years old, I was paralyzed from the waist down in a car accident that instantly killed both my parents. Living so close to Redstone Arsenal in Huntsville, visiting the U.S. Space & Rocket Center here every year, I had gained a real respect for the American space program and NASA, but I never really believed I would someday work here. That changed in the summer of 1995. I vividly remember my first day at work in the Shuttle Propulsion Office’s Reusable Solid Rocket Office, temping as a management assistant for someone taking maternity leave. I was nervous, but I was also determined to show everyone that, even though I was in a wheelchair, I could perform my duties and did not want special attention. I had been raised to believe that any job worth doing is worth doing right. I adhered to that philosophy then, and I still do today. After the summer program, I stayed on at NASA and went to college at the same time. I worked for 2 years as a management support assistant for organizations in the Space Shuttle Propulsion Office – including the Propulsion Systems Integration Office, the External Tank Project Office, and the Reusable Solid Rocket Motor Project Office. In 2000, in the wake of a lifted NASA hiring freeze, I became a program analyst in Marshall Space Flight Center’s Propulsion Systems Integration Office. For the next 6 years, I managed project support budgets and analyzed contracts and contractor activities for Marshall projects, including the Reusable Solid Rocket Motor Project Office, the External Tank Project Office, and associated work at Michoud Assembly Facility in New Orleans. Since July 2006, I have worked for the Office of the Chief Financial Officer, assessing budget information at every level of the center and preparing top-level financial reports to be briefed to Marshall’s senior executive staff. I love my job, and my life. I’ve learned that you can never give up, no matter what obstacles the world puts in front of you. My NASA career has provided me with the medical insurance I need, with no preexisting clauses. More importantly, I work with professionals in a family atmosphere, I love the work I do and the friendships I have made – and, most critically, I am able to provide for my daughter whom I love so much. NASA has allowed me to grow professionally and at home, and I am paying that forward, teaching my daughter to apply herself well in everything she does so that she too can be successful in her career and in her life. Marshall is a place where people want to come to work. We work hard, as a family, and sometimes we even bring our families at home together to play hard. If I am remembered in the future, I’d like to be remembered as a member of two families – as a hard-working, independent woman who takes enormous pride in her job and her team at NASA, and as a loving mother who supports her bright, talented daughter 100 percent and encourages her daily to pursue her goals and achieve her dreams. She can be anything she chooses to be. I am proof of that. When Loria West was 9 years old, she suffered the loss of her parents in a tragic car accident. 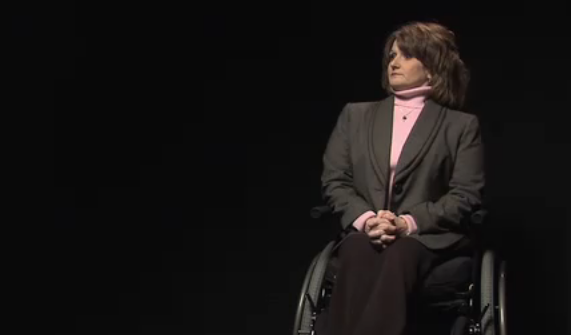 That same accident left her paralyzed from the waist down; however, her new circumstances did nothing to slow her down. Quite the contrary. “I had been raised to believe that any job worth doing is worth doing right. I adhered to that philosophy then, and I still do today,” she said. Today, she handles budget information and prepares top-level financial reports for Marshall Space Flight Center senior executive staff. During her career with NASA, she has also managed the External Tank Project support budget, and served as a program analyst. Clearly, what initially began as a summer co-op position at NASA has led to the career of a lifetime for Ms. West, but not without plenty of hard work and the conviction to, in her own words, “Move forward. Just do what has to be done.” She is a source of inspiration to all young women, especially her own daughter Gabrielle. Her success is also proof that adversity can be a positive thing. Ms. West earned a degree in business administration from Athens State University in Athens, Alabama.